Without further ado, here are the rumors! One of the mods later posted that he received some confirmation, but he also remarked that some of the things mentioned are either highly speculative or maybe even untrue. Sooooooo… what do you make of it? We’ve heard rumblings before that Han Solo might be back in some form or capacity. At the time it was speculated that a flashback scene would make the most sense. We know that footage of Carrie Fisher in The Force Awakens will be used. It is reasonable to assume that some of the original scenes involved Han. Maybe they will add a de-aged Luke to these flashbacks and through CGI and other trickery make it appear as if Han, Luke and Leia actually share a scene together. This would most certainly be something that could appease the fanbase and make a lot of fans, if not happy, but at least contented that we would get one final scene of the three original trilogy main characters together. Something which The Force Awakens failed us to give. Also, it is interesting to read that Rose’s role may be dialed down a bit for Episode IX? In a a movie filled to the brim with established main characters and OT characters plus a host of all new characters it would only make sense to give Rose somewhat of a backseat here, since she is not really essential to the Skywalker saga overall in any way. Keri Russell is involved with Luke’s storyline… Would they really introduce Mara Jade, or someone like her, so late in the game? And Ben Skywalker flies the Falcon? Did he steal it? Is he flying into the sunset with Rey on their honeymoon to Tatooine? Didn’t he want that piece of junk destroyed in The Last Jedi? What made him change his mind? 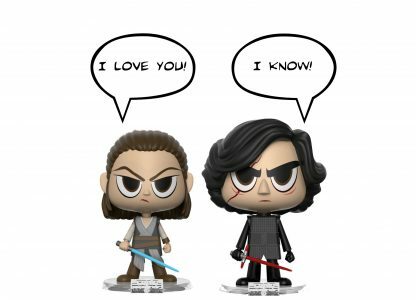 The unquestioning love of Rey? Or are we talking young Ben here who stole daddy’s Falcon for a joyride and who gets sent to Luke’s Jedi Academy as punishment, the seed of everything evil that would later befall the galaxy? Also, after years and years of complaining we might actually get to see a prominent OT alien race in the sequels which, until now, had a disturbing lack of known alien species in favor of new creations which were not always met with universal praise? And finally: we get to see Tatooine after all in the sequel trilogy? What could Rey be doing there? Visit her grandmothers grave? Sell C-3PO to the Jawas? Go undercover as a scantily clad dancer in Jabba’s son’s palace? Anyway, what do you think? And if any of these rumors were true, would you like the direction this movie might be heading into? Several rumor reports say that Episode IX will be somewhat of a course correction for Star Wars and yet another rumor report from a short while ago postulated that Episode IX will make fans who disliked The Last Jedi happy, but that even fans of The Last Jedi will like what Episode IX will be doing. Star Wars certainly needs a true crowd pleaser again, something the fandom can universally like or at least not hate. I would certainly welcome most, if not all of the rumors here. Now, it still says nothing about plot. We may have to wait a while longer before more details emerge here. Until then all we can is speculate! And remember, this is all supposed to be fun! So let’s have fun! It’s Friday night, after all! Previous Article: Bubblegate Again! And With An Impossibly Difficult Figure To Secure! Next Article: The Black Series Rocket Trooper Up For In-Store Pre-Order!